As a busy entrepreneur, you probably feel like time isn’t on your side. Right now, for instance, you might be half focused on keeping your new year’s goals on track and half focused on gearing up for tax season. Plus, the end of the month is closing in—and you still need to generate more leads. Well, don’t freak out. There’s still time to implement one or more lead-gen tactics that can get you dozens of leads over the next few days. I’ve compiled a list of easy marketing tactics you can execute over the weekend. Of course, you can keep them running long after this week or this month—and bring in more leads no matter how chaotic everything else gets. Some tactics will make more sense for your particular business than others, but I’m willing to bet that at least one marketing idea on this list can get you at least 50 (and potentially many more) leads in the course of a few days. And if you’re feeling ambitious, download this bonus guide with more than 40 lead generation ideas. You’ll learn the best opt-in offers and offline tactics to turn your audience into customers. In business, the messenger is sometimes more important than the message itself. This principle is easy to forget when you’re following the same old content pattern: post, publish, and promote. You’re just trying to spread your message to as many people as possible. Most of your potential leads don’t know your brand, and they probably glaze over your advertisements. These people must trust you before they sign up for your newsletter or buy your products. Well, it takes a long time to build trust and you need leads today. To speed up the trust factor, it’s time to enlist the help of your greatest (and oftentimes most overlooked) marketing asset—your customers. A Nielsen report found that 83% of people worldwide say they completely or somewhat trust the recommendations of their friends and family. Your customers know people—business partners, family, and friends—who may be interested in your products. And because these potential leads trust their network of colleagues, they will be more likely to trust your brand. To benefit from word-of-mouth marketing, create an email campaign asking your customers for referrals. Segment your email list to find the most engaged customers. These individuals may buy from you regularly, participate in your loyalty program, or sign up for your contests and events. Write a short and simple email asking customers to tell their friends about your company. You may even want to sweeten the deal with a discount. In the email, direct your customers to a landing page with an opt in form. Then, customers can enter their email address along with the emails of two or three friends who might enjoy your product, too. Expect to get 50+ leads if your business … has a well-established and active email list. Facebook reigns as one of the top sources for generating leads, and your ideal audience is probably on Facebook. That audience might include your Facebook fans, a certain demographic, or people with certain behaviors (such as shopping for specific items or preparing to move to a new home). When creating the actual ad, stay away from direct sales pitches if you’re looking for brand new leads. Instead, offer your audience a free gift, like a webinar, checklist, or resource guide. 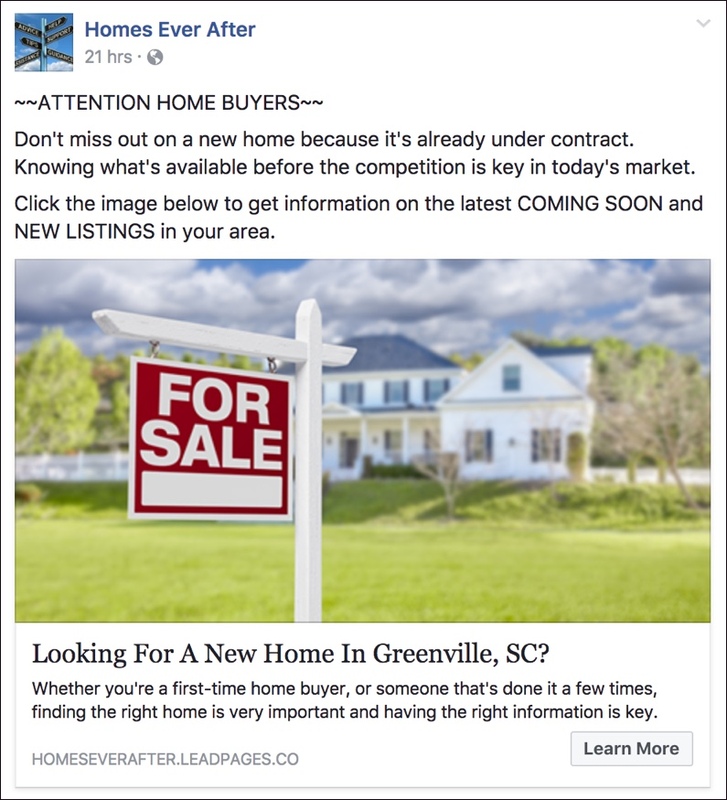 In the Facebook ad below, Homes Ever After offers home buyers information about the latest real estate listings. Now, you need to send your qualified traffic to a highly targeted landing page (the kind you can create in about 10 minutes with Leadpages). A good opt-in page is so simple that you can quickly duplicate it and customize it for a different Facebook audience. And by customizing the page to your audience, you increase your chances of turning visitors into leads. Expect to get 50+ leads if your business … has anything to offer that appeals to consumers. This is one of the easiest and most widely applicable marketing campaigns you can implement! During middle school, show-and-tell presentations were always my favorite. It was always fun to hear stories from professionals and learn more about what they did. Luckily, show-and-tell isn’t reserved just for kids. The goal of an AMA is to actively engage with people. It’s an effective way to not only show people what you do but also to learn more about your leads. And it can work even if you’re not remotely famous. “This is a fantastic way to put a brand directly in front of its target audience. It provides people from all over the world the chance to ask direct questions to an expert,” said Kristopher Johnson, Digital Marketing Strategist at The Gantry Restaurant & Bar. He was inspired to set up an AMA with their head chef to try to drive passionate foodies to the restaurant. 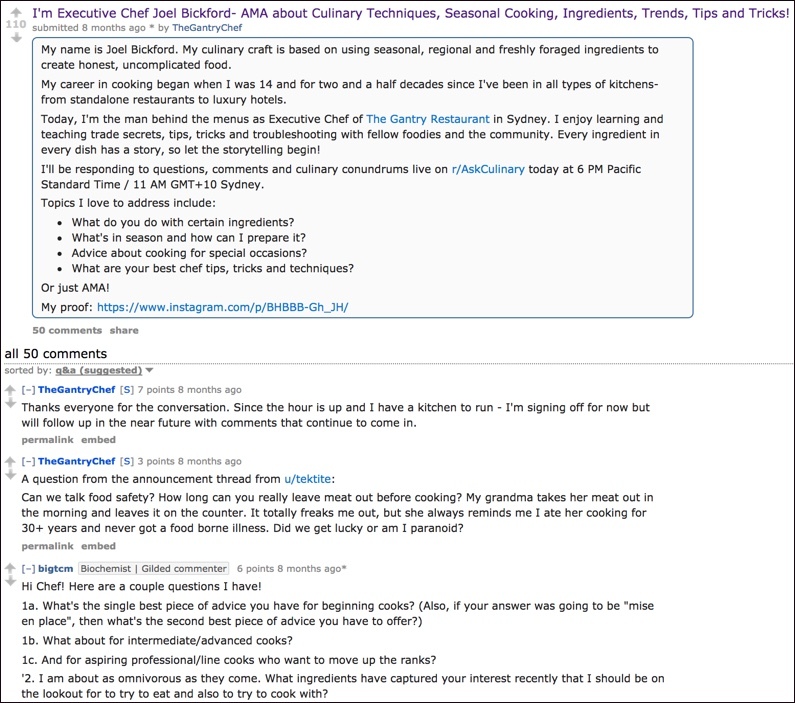 Here’s a snapshot of the AMA with culinary expert and executive Chef Joel Bickford. Kristopher told me that their traffic from this strategy continued over the course of a few months. To get the most out of an AMA experience, I recommend creating a landing page with an opt-in offer specifically for this audience. That way, you’ll transform excited participants into bona fide leads. Expect to get 50+ leads if your business … has an expert on hand with a unique job, backstory, or perspective. Don’t leave visitors empty-handed after they read your valuable content. You can create a free report or white paper and offer it as a bonus when they provide their email address. Find your most popular blog post in Google Analytics. Log into your account and set the timeframe from the last 6 or 12 months to the present day. 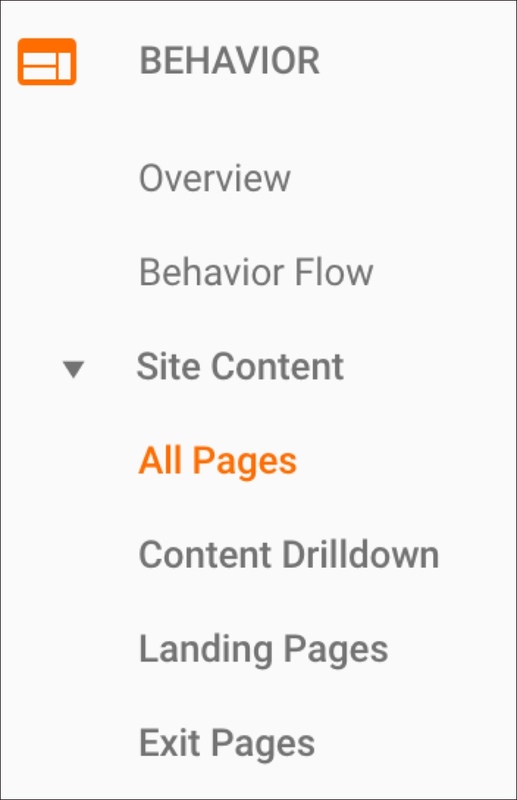 Then, in the left menu, click “Behavior,” “Site Content,” and “All Pages.” This will generate a report showing you the pageviews of all your pages within the defined timeframe. After identifying your high-traffic post, you can start creating a content upgrade to add to the page. You want to give the reader extra content that correlates to the topic of the blog post. So, if you’re a food blogger with a popular post about the nutritional benefits of tomatoes, a nice content upgrade would be a recipe booklet that includes this plump red fruit. If you’re a Leadpages customer, creating one of these is easy. With our new drag-and-drop Leadboxes builder, you have complete control and design of the pop-up window. As simple as it is, this marketing tactic gets serious results. “Recently, we have been able to triple our opt-in rate by using Leadboxes with a content upgrade,” David James, the founder of Business Growth Digital Marketing, told me. David’s high-converting content upgrade was a chapter from his SEO ebook. “The results are promising and I am encouraging others to adopt a similar tactic,” he said. Expect to get 50+ leads if your business … has posts or pages that receive at least 100–200 pageviews a day. Sure, people enjoy learning from experts. But they also desire interactive learning, where they can engage with the presenter. That really works in your favor when you’re planning a webinar—one of the best options to interact with your audience, even if you’ve never held one before and aren’t entirely sure what you’d talk about. You might be wondering: How am I going to have time to plan, promote, and host an entire webinar this weekend? Well, you don’t. You can start promoting your webinar (Facebook ads work great for this, too), and then, finish planning your presentation as your leads start signing up. Decide on three main points you want to discuss and what value you want to offer attendees. If you’re worried about the time investment, use a Q&A webinar format, so you don’t necessarily have to plan as much content in advance. Then, pick a date and time and add this information to your webinar registration landing page. Check out this webinar registration landing page from Tara Reed, CEO of AppsWithoutCode. It gives the prospective attendee a glimpse of what to expect from the webinar and offers social proof to validate the speaker’s authority on the topic. Expect to get 50+ leads if your business … has something to teach that lots of people want to know. The purpose of an exit popup is to engage website visitors one last time before they leave. It’s your chance to navigate them toward an offer they can’t refuse. 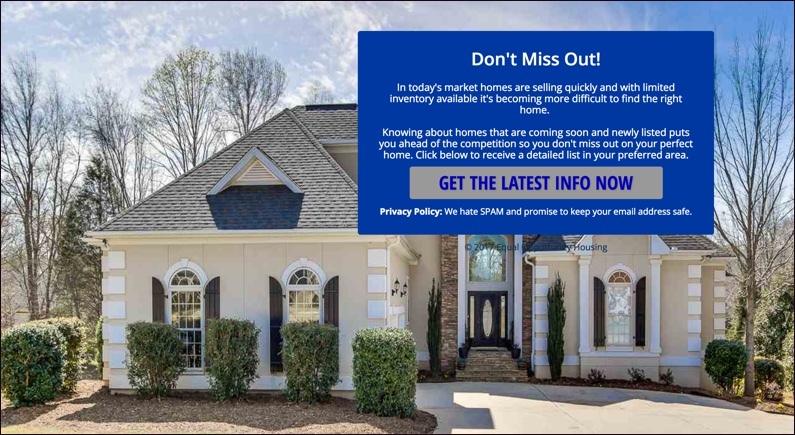 A well-executed exit popup regains the attention of your audience and convinces them to sign up for your mailing list, download a content upgrade, or even redeem a coupon. Focus your popup message on solving your visitors’ problems by offering something of obvious value. Again, use Google Analytics to find your highest-traffic pages. If you’re a Leadpages customer, you can use a Leadbox as an exit popup. You can control how often the visitor sees the popup if you’re worried about annoying regular visitors. 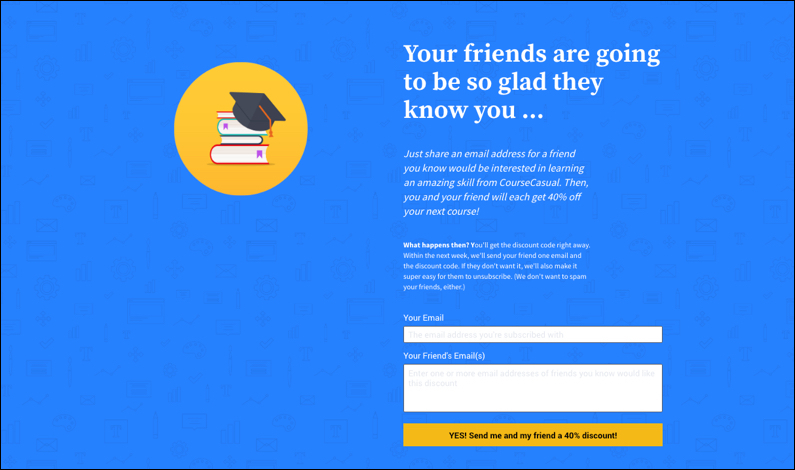 Similar to a landing page, the copy for your exit popup should be compelling and persuasive. Offer the visitor something of massive value and encourage them not to leave without their free gift. Check out the exit popup below from The Profit Titans. Exiting visitors see a personal message from Hena. (It’s a little harder to turn down an offer when the creator is staring you in the face.) The popup emphasizes the word “free” to make the decision as easy as possible. But most importantly, the offer itself is compelling: substantial, quantifiable content with a clear and intriguing benefit. Expect to get 50+ leads if your business … has a website that gets 2,000–5,000 total pageviews per day. 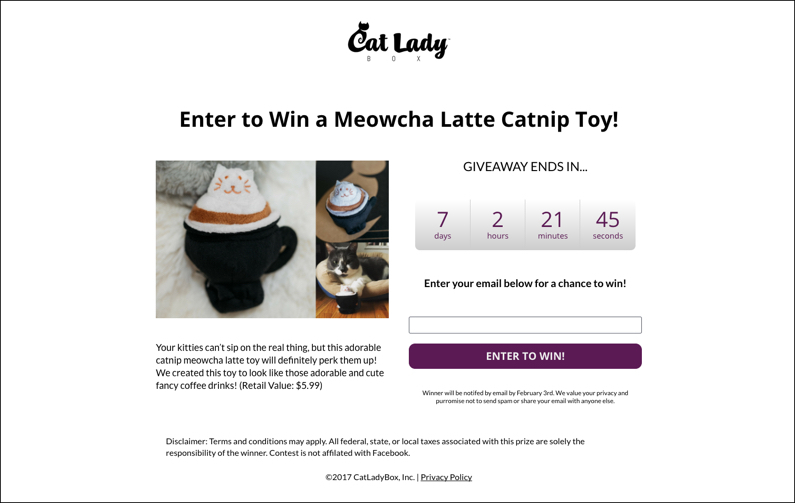 A giveaway is a powerful method to promote your business to leads. While reading about the cool goodies they could win, these individuals will also learn more about your brand. Contest-entry pages are among the highest-converting landing pages we see at Leadpages. It’s a no-brainer for people to enter a free contest for a chance to win a prize they really want. They incur no cost and potentially could receive all the gain. Ready to create your own giveaway? Determine what you’re going to actually give away to participants. Some brands like using their own products to draw attention to what they offer in the marketplace. Other companies stick to giving away gift cards to popular stores but a prize that’s closely related to your business will get you much more qualified leads. If you’re a service-based company, your prize could be as simple as a free hour of your time. After you select the prize, set the contest deadline. Then, use this information to launch the contest page and begin promoting it. Below is an actual high-converting contest page from a Leadpages customer. Cat Lady Box customizes the page with its brand logo and displays the prize with an image collage. What’s great about this contest page is the countdown clock—urging people to enter the contest before the deadline ends. And don’t panic if you don’t have the prize fulfillment details ironed out before launching. While you’re collecting entries, you can figure out how you’re going to deliver the prize as the deadline approaches. Expect to get 50+ leads if your business … can think of anything compelling to give away to consumers. This is another tactic that can work for most industries. Rushed for time? Try any or all these easy marketing tactics to bring more leads to your business. And download this lead generation guide with more than 40 ideas to jumpstart your sales funnel. How do you plan to generate more leads over the weekend? Tell us in the comments!